The Traveling Tripod: Mom said “Sit up straight,” but, did you listen? Up to now, that’s been easier said than done. When you sit in a chair for any length of time, unless you have excellent posture discipline, you likely are sliding into a less-than-ideal position. At the 2011 Travel Goods Show I was introduced to a product that fixes all that. The BackJoy Core is a lightweight device that you sit on whenever or wherever you plan to spend some time. The BackJoy is not a cushion, but rather a cleverly designed curved surface that cups your buttocks and immediately corrects poor posture. You can use the BackJoy on upholstered pieces, on hard-surfaced chairs, in an airplane, on church pews, at the stadium or in your car. No matter where you place it, when you sit on it, your spine is supported and balanced. Your posture is improved automatically. The BackJoy is manufactured from a copolymer polypropylene plastic and should hold its shape forever. 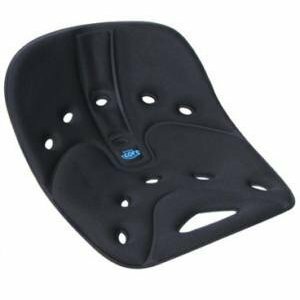 Many posture cushions merely give the illusion of improving your posture by padding your behind. The BackJoy actually cradles your buttocks and locks them into the supporting role they are supposed to play. Most people notice the improvement immediately. BackJoy only weights 12.5 oz. so it’s light enough to take anywhere. With a large slot on the front end, you can even clip it to your backpack. It comes with a 30-day guarantee so you’ve got nothing to lose except bad posture and back pain. Your mother will be so proud. Order the BackJoy right from their website at http://backjoy.com.